Working with a predominantly abstractionist context, a group of younger artists forged a mode of representational art in the 1950’s and 1960’s that made use of Abstract Expressionist painterly freedom and spontaneity in order to document the life around them. Wolf Kahn, one of the leaders of this group, directed this approach toward the painting of the landscape, which he has steadfastly developed over a period of forty years. Today Kahn’s unique use of color has placed him at the forefront of American representational art, and has made him one of the most highly regarded colorists working in America today. Accompanying the text is an analytical essay by the painter and critic Louis Finkelstein, which discusses the origins and value of Kahn’s unique fusion of abstraction and representation. This volume traces Wolf Kahn’s oeuvre with 100 plates in full color, as well as a number of documentary photographs. It is an essential source book for the recent history of American art, and it furnishes proof that, through the age of Pop, Op, Minimalism and deconstructionism, an artist can successfully hew an independent course dedicated to the problems and pleasures of pure painting. 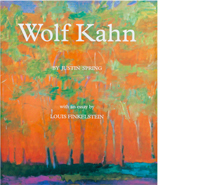 Wolf Kahn / by Justin Spring; with an essay by Louis Finkelstein.